Before printing, you must install the Build Plate into the Voxel8 Printer. 1. 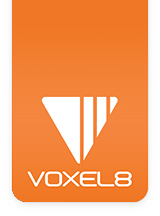 Locate an orange colored aluminum build plate (see Picture 001) from within your Voxel8 Developer’s Kit box . They are tucked inside the top foam near the cardboard compartment boxes. NOTE: Only "Get it First" customers will receive two build plates. You can use either one. We recommend putting the extra build plate in a special place that is NOT the box, unless you feel confident it will not be thrown away or forgotten. Picture 001: Voxel8 Build Plate. 2. Open up the Voxel8 protective hood and inspect the inside of the Voxel8 Developer's Kit Printer (see Picture 002). Remove any foam packing inside the build area that may be in for shipping purposes. NOTE: For future reference, you can find a schematic of the printer and all its parts here. Picture 002: Opening and closing the printer hood. 3. Remove the tape holding both cantilevers down in the bed area on both the right hand and left hand sides (see Picture 003). Make sure that both levers are in their inset slots placed before continuing. NOTE: Failure to remove these pieces of tape will cause the Alignment script to fail. Be sure to remove the tape, and free the levers ON BOTH SIDES. Picture 003a: Locating the tape holding down the cantilevers in the bed area. Picture 003b: Removing the tape holding both left and right cantilevers down in the bed area. 4. Insert the Build Plate into the Voxel8 Developer's Kit Printer as shown below (see Pictures 004-008). Picture 004: Voxel8 Build Plate is not installed (yet). Picture 005: Voxel8 Build Plate is being installed. Picture 006: Voxel8 Build Plate is being installed and magnetically set in place. Picture 007: Voxel8 Build Plate has been successfully installed and is kinematically coupled. 4. Practice inserting and removing the build plate so you get a feel for magnetic kinematically coupling feature. It should always snap nicely in place. Picture 008: Add/Removing the build plate. IMPORTANT NOTE: In the future you should always check to make sure the build plate is NOT heated before removing it from the Printer. 5. Locate the blue tape squares from inside your Voxel8 box, and carefully apply one to the build plate (see Picture 009-012). NOTE: Some people might prefer to apply the build tape when the build plate is not inserted into the Voxel8 Developer's Kit printer which is also an acceptable method. Picture 009: Precut 6"x6" tape square is applied to the empty build plate. Picture 010: Precut 6"x6" tape square is being applied to the empty build plate. Picture 011: Precut 6"x6" tape square is being applied to the empty build plate. Picture 012: Precut 6"x6" tape square is being applied to the empty build plate. TIP: Be carefully not get air bubbles or creases into the painters tape. You want the tape as flat as possible on the build plate for the best printing experience. 6. After the blue tape is applied, you can practice inserting and removing the kinematically coupled build plate (see Picture 013 to 014). You can also check to make sure that the painters tape is completely flat across the build plate surface. Picture 013: Grabbing the Voxel8 Build Plate to remove it. Picture 014: Removing the build plate out from the bed area. Picture 015: The Voxel8 build plate is properly installed and applied with a blue tape square. 7. Now that you are done installing the build plate, it's time to move onto the next step: Loading the Plastic Filament.